Just one of the many designs that will keep your children amused for hours. Children have always loved building and playing with LEGOTM. 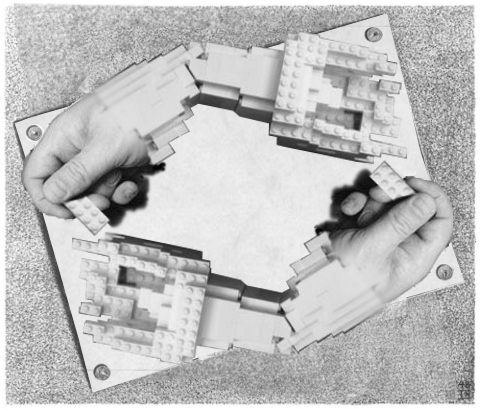 LEGO EscherTM allows kids to create an entire world; with people and places that can be seen in the works of MC Escher. Children will love creating scenes they have know and love and become familiar with different shapes, sounds and colours. LEGO EscherTM comes in a fantastic range of sets, which are used to replicate the common places that children have seen with parents or carers. Children can choose from sets designed on CastrovalvaTM, RelativityTM, Another WorldTM, Curl-UpTM, and BelvedereTM. They will have hours of fun building and playing in their own little worlds; developing their imagination and assisting with problem-solving and four dimensional non-Euclidian geometry.